A fairly new member, Tim Fairbanks, contacted me recently after seeing some of the paintings in my profile. He presented me with a challenge. He sent me 5 snapshots of different elements from his hometown of Skagway, Alaska, and asked me to do a painting and incorporate them all. 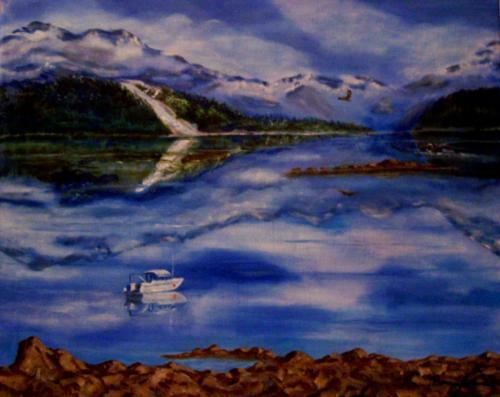 Since his grandfather homesteaded at the base of Davidson glacer, I entitled the painting, "Davidson Glacier". even though the scene is not true to life. Tim just received the painting via USPS and was very pleased with the outcome.